After the heartbreak of the previous week, there were some real hesitations about the ability of the team to hold out the entire game. The challenges during the first part of the season have been about getting going in the first half and then finding themselves playing catchup for the remainder of the game. In the game against the Broncos, Morris started the game really strong but not even close to how well the defense held off the Peyton passing attack. Just when they got going, it all went south. It was definitely possible that the same result would happen with the Chargers, who have had their moments so far this season. San Diego’s offense was stifled for most of the first half, but so was Washington’s. The San Diego D was able to pick off RGIII while he was backed up at his own end zone for a touchdown. 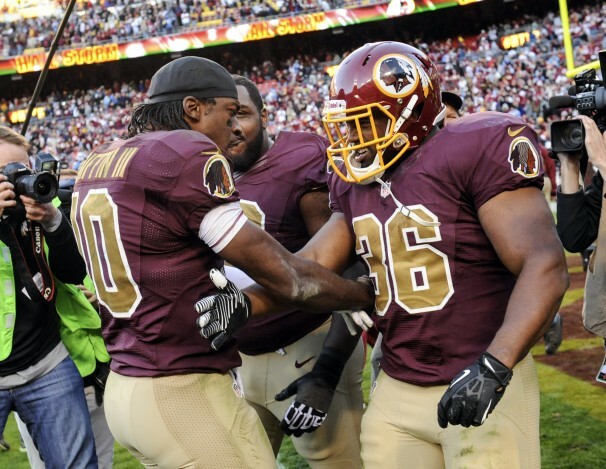 Morris followed it up with a touchdown of his own, as the Washington offense was able to get the run game going. The Chargers punched it in once more for the lead before the half but they also were able to block two Washington field goal attempts to keep the 7-point advantage. 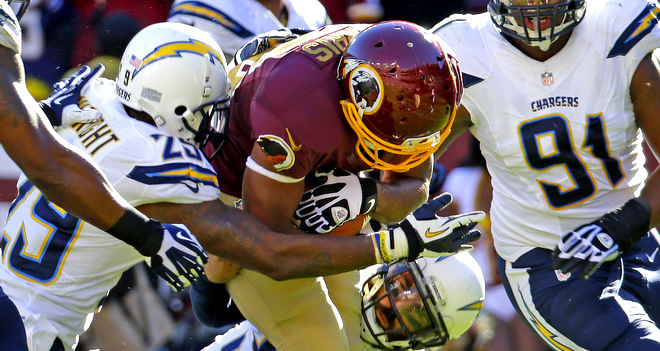 Other than a Redskins touchdown by Darrel Young, the third quarter was quiet. With the score tied into the fourth, Washington made one of its best efforts to jump out to a 10-point lead, including another rushing TD for Young and Forbath getting the necessary protection to get his kick off. With 7 minutes left, the 10-point lead seemed like a nice luxury for once but was short-lived. Rivers connected with Allen for a touchdown and then the defense stopped Washington short of field goal range. With just over 2 minutes left, the Chargers marched down the field and got to the 6-yardline. A pass by rivers connected with Woodhead but failed to cross the plane (after overturned by the replay booth). The Washington defense stepped up and held the Chargers to a field goal to push it to overtime. Winning the coin toss, Washington finished up the game with a respectable drive, including some hard running by Morris and Young’s third rushing touchdown. The game was not won by RGIII’s brilliance or his legs or his arm. It was won by hard-fought running. Morris racked up 121 yards on the ground. Helu had 2 rushes for 23 yards. Young got the 3 touchdowns with 12 yards. The group rushed for a total of over 200 yards. The running attack won the game. Shanahan finally got the message. Maybe he read the social media posts. 40 carries compared to 32 pass attempts. Good call. The defense stepped up at the right moments. They saved the game in the fourth quarter at the end. Garcon reemerged as the great wide receiver he is. 172 yards is nothing to sneeze at. The defense is inconsistent. The 10-point lead is something that should be protected better, especially in the fourth quarter. Momentum swings are making games more challenging to get through. The kick blocking was a major challenge. Two blocked kicks in the first half is not acceptable, considering the other problems with the special teams. RGIII did not get going like he should, but it somewhat worked out with the focus on the run game. He passed for 291 yards but could not find the end zone. Dalton is a fantasy nightmare at the moment. 5 TDs one week and 3 INTs the next. Miami was able to steal that one away in OT with a sack of Dalton in the end zone. Kansas City may be the most boring team to watch in the league, but they are the only ones sitting at 9-0. Their defense kept them alive against the Bills. Romo ran an impressive fourth quarter drive to survive against the hard rushing attack of Peterson and the Vikings, 27-23. Jake Locker, Chris Johnson, and Tennessee picked it up in the second half to pull away from and overwhelm the Rams defense for the win. The Jets stunned the Saints with Chris Ivory’s 139 yard rushing compared to Brees throwing for 382 yards and connecting with Jimmy Graham for 116 and 2 touchdowns. Atlanta looked depleted against the Panthers, who were able to ride Tolbert and Newton to a 34-10 victory. Philadelphia may have found their QB (at least for 1 game). 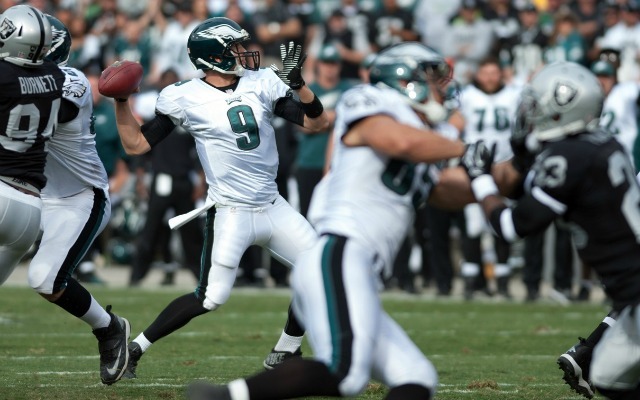 Foles threw for a record-tying 7 touchdowns in the slaughter of Oakland. Seattle struggled to keep up with Tampa Bay and had to take it to overtime to survive a 27-24 game. Cleveland upset Baltimore as both teams were coming off of losing streaks and failed to get their rushing games going. New England beat up on Pittsburgh as Brady reemerged to his more expected QB status. Houston put up quite a fight (especially after suffering a personal/team tragedy) but could not survive against a tough Colts team. Keenum may be able to help them dig out of their hole. Chicago and Green Bay became the battle of the backups when Rodgers went down with a shoulder injury in the first quarter. Brandon Marshall racked up the yards and a touchdown to give them the edge in the win at Lambeau Field.